Ramadan is particularly punishing in Hodeidah on Yemen’s west coast, where the temperature is currently 36C. Many of the Houthi rebels who have held the city since 2015 are used to the cooler highlands and struggle in the heat. Tensions are running high in the port city. Arab coalition forces that back Yemen’s exiled government are now less than 12 miles away from Hodeidah’s edges; everyone inside knows the battle is imminent. As Yemen’s key commercial centre, through which more than 70 per cent of the country’s imports, food and aid shipments flow, an offensive to retake the city has always been inevitable. In the last few days, however, Yemeni, Saudi and UAE troops have covered such huge amounts of territory the imminent fighting has arrived much faster than most were expecting – and fears for the country’s embattled civilians are growing. “What happens to Hodeidah is going to have huge consequences for Yemen’s war,” said Adam Baron, a visiting fellow with the European Council for Foreign Relations (ECFR). Hodeidah is Yemen’s lifeline. Even before the war, it handled most imports in a country where a staggering 90 per cent of food had to be imported. Seized by the Iran-backed Houthis early in the now three-year-old war, the city has been subject to a Saudi-led coalition blockade since 2015, which humanitarian organisations say is largely responsible for the fact eight million Yemenis are now living on the brink of famine. A total sealing off of the port in November 2017 – retaliation for a Houthi ballistic missile that landed near the Saudi capital of Riyadh – is estimated to have pushed an additional 3.2 million people into hunger, the World Food Programme says. The new UN envoy to Yemen, Martin Griffiths, has warned that the new offensive to retake Hodeidah will result in mass displacement and “in a single stroke, take peace off the table”. But the fracturing of rebel allegiances after the Houthis killed former president Ali Abdullah Saleh in December has seemingly galvanised the Arab coalition. Saleh’s nephew, Brigadier-General Tareq Mohammed Saleh, has formed a new brigade that has so far fought ferociously against the Houthis who killed his uncle. The Houthis are expected to withdraw to the mountains surrounding Hodeidah when fighting in the city proper gets under way, but have promised to give the coalition “hell on hell” before they do. “Further military pressure on the Houthis may have the reverse effect of making them less amenable to enter proposed peace negotiations, since they will be in a weaker position,” Elisabeth Kendall of Oxford University said. Retaking Hodeidah could potentially open a pathway to finally retaking the Yemeni capital of Sanaa from the rebels – but that does not mean Houthi capitulation, Dr Kendall added. The human cost of winning the city of 600,000 people back could be catastrophic, several aid organisations have warned. The Houthis are known to heavily mine territory as they exit it. Irin News reported earlier this month that UN operational plans to evacuate 5,000 civilians to safer areas ahead of the fighting “flopped”. “An additional 340,000 people could be displaced should Hodeidah come under attack,” said Bhanu Bhatnagar, a Save the Children spokesperson. The Arab coalition, which has been criticised over the unnecessary loss of civilian life in bombing campaigns in other Houthi areas, is well aware the international community is watching the Hodeidah offensive. “It is in the coalition’s interests to make sure Hodeidah isn’t destroyed,” said Baron of the ECFR. The port must remain open at all costs, Bhatnagar said. When the sound of bullets and bombs does die down, a different type of battle will begin. There are growing tensions in the Arab coalition over the UAE and Saudi Arabia’s growing influence in parts of Yemen in which their troops are in control. 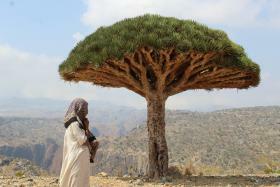 The Yemeni government’s anger led to a diplomatic standoff over the Arabian Sea island of Socotra between the UAE and the exiled Aden government earlier this month. Whether Tareeq Saleh’s forces call the shots on the ground when the battle ends is also a headache for Yemen’s embattled president, Abdrabbuh Mansour Hadi. All parties will be keen to take credit for any successes – and avoid blame for any failures – in the fight for the city. “That battle will be as active as the fighting itself,” said Mr Baron. Yemeni Nobel peace prize laureate and activist, Tawakkol Karman, is worried about the battle to come. “Hodeidah’s operation will leave behind an unprecedented human disaster,” she said. “This will only add to Yemenis’ agony. Saudi Arabia and the UAE will ban the legitimate government from entering Hodeidah, like they did in Aden.